Note from DJ: This is a guest post from one of our new contributors, Citrix CTA Chris Schrameyer! Welcome, Chris! You can follow him on Twitter @Schrameyer. This was my first Synergy as a Citrix CTA. On Monday we were invited to the first half of the CTP meeting, where we heard from the Executive Leadership Team. It was an amazing morning full of new announcements, questions and answers, and meeting the CTA’s and CTP’s. I was able to meet and have discussions with so many people I had followed online. Having all of those smart people in one room was truly amazing. What a great way to kickoff Synergy! We followed that up with a CTA meetup in the evening, giving me a chance to meet some wonderful and intelligent Citrix enthusiasts. 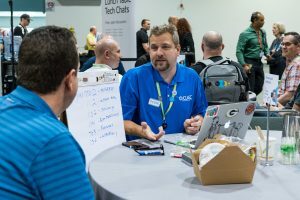 I was fortunate to join a group of wonderful CUGC members in leading the Lunch Table Tech Chats at Synergy. All of the leaders were fantastic and I consider them friends as well as colleagues. These smart people are: Jon Bucud, Steve Elgan, Don Wong, DJ Eshelman, Trentent Tye, Saadallah Chebaro, Benjamin Crill, Patrick Coble, and Giuliana Crespo. Do yourself a favor and follow these fine folks on twitter and on the CUGC site! The Tech Chats were informal discussions where I discussed with and exchanged many outstanding ideas with other Citrix users. It’s extremely valuable to listen to other folks’ perspective on how they use Citrix technologies and the challenges they face. I also enjoyed educating customers on the features and capabilities of the ShareFile platform. The interaction and dialogue at the Lunch Tech Chats was my favorite activity at Synergy. I recommend everyone try to attend next year. Special thanks to Stephanie Roper @Roperjs, Kimberly Ruggero @KLRuggero and Perrine Crampton @pcrampton for all the support they provided. 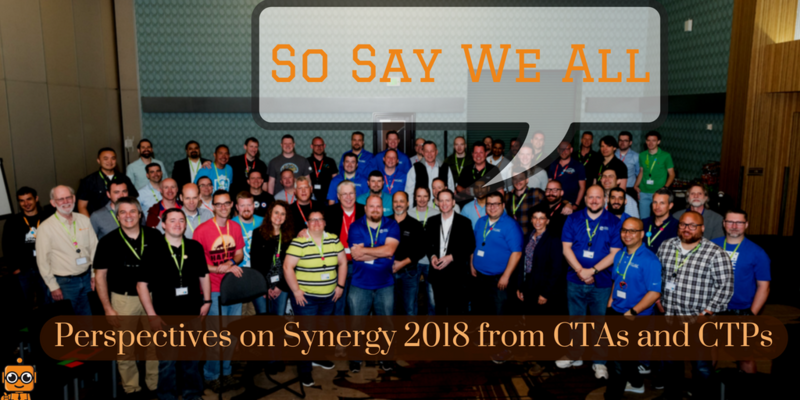 As a CUGC (Citrix User Group Community) leader I had many opportunities to volunteer and help make Synergy successful. To start the week off we all got together for the CUGC Pregame reception. This place was packed! It was great to see so many CUGC members and to see the community continue to grow at such a fast pace. Next year we’re going to need a bigger room! I also volunteered assembling battle bots at the Simply Serve booth. It was a great way to give back to the community! We had several CUGC informal meetings where we had the ability to share success stories, failures, and ideas for the future. Having fellow CUGC leaders physically in one location was invaluable and in itself made Synergy worth the trip. I also participated in the Midwest XL CUGC planning meeting. It was great having everyone in person as we planned our next big event. The CUGC Leadership workshop on Thursday was amazing. 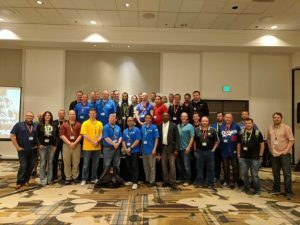 CUGC leadership brought in professional speakers and trainers to help the local CUGC leaders role-play and become better meeting planners and facilitators. This session could have been twice as long and everyone in the room would have loved the extra time. Special thanks to Jennifer Gibbons, Brad Hornback @BradHornback, and George Abar (and the rest of the CUGC steering committee – https://www.mycugc.org/p/cm/ld/fid=17) for scheduling this fantastic session! As a Citrix insider I had the opportunity to participate in a few focus groups. The focus groups gave an opportunity to provide direct feedback to product managers on various Citrix technologies. Through the Insiders program I had previously submitted surveys on a few topics, and these focus groups gave me the ability to speak one-on-one with the Citrix folks responsible for these services. It was a great dialogue between the members of the focus group and the Citrix employees. The focus groups were one of my favorite Synergy activities, as I had a direct line to let my voice be heard in shaping Citrix products. I recommend that those who are interested in having their voice heard to join Citrix Insiders (https://citrix-insiders.citrix.com). Thanks to Sue Morgan for all the support she provided to the Citrix Insiders during Synergy. Community. Volunteering. Networking. These are my takeaways from this year’s Synergy. Sure, there was a lot of great technology information, keynotes, updates, etc. But this information I can usually find online. For me, the things you can’t get online are the things that I value most by attending an in person event like Synergy. Talking with other Citrix enthusiasts, sharing ideas, sharing complaints. Exchanging contact information with new people I meet so we can talk further. That’s what makes the Citrix community so great – the people. Again, thanks to all those who spent months planning this event. The CUGC leadership team, Citrix Insiders team, the Synergy planning team, and all of the CTP’s and CTA’s who participated. It was truly a great community effort. See you next year in Atlanta!